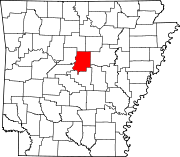 Location of Greenbrier in Faulkner County, Arkansas. Greenbrier is a town that developed from a minor brothel on the Butterfield Stagecoach route into a bustling city. The town was named for the greenbriar vines which grew along the creek through the town. Greenbrier is located 12 miles (19 km) north of Conway on Highway 65. Recent years have seen continued growth as Greenbrier becomes a bedroom community for Conway. Greenbrier is located in northwestern Faulkner County at 35°13′46″N 92°23′21″W﻿ / ﻿35.22944°N 92.38917°W﻿ / 35.22944; -92.38917 (35.229444, -92.389052). According to the United States Census Bureau, the city has a total area of 7.9 square miles (20.5 km2), all land. As of the census of 2000, there were 3,042 people, 1,137 households, and 892 families residing in the city. The population density was 392.6 people per square mile (151.6/km²). There were 1,247 housing units at an average density of 160.9 per square mile (62.1/km²). The racial makeup of the city was 97.37% White, 0.59% Black or African American, 0.46% Native American, 0.07% Asian, 0.36% from other races, and 1.15% from two or more races. 0.99% of the population were Hispanic or Latino of any race. There were 1,137 households out of which 42.5% had children under the age of 18 living with them, 61.7% were married couples living together, 13.2% had a female householder with no husband present, and 21.5% were non-families. 19.1% of all households were made up of individuals and 7.0% had someone living alone who was 65 years of age or older. The average household size was 2.68 and the average family size was 3.06. In the city, the population was spread out with 30.3% under the age of 18, 9.1% from 18 to 24, 31.9% from 25 to 44, 18.9% from 45 to 64, and 9.8% who were 65 years of age or older. The median age was 32 years. For every 100 females, there were 92.3 males. For every 100 females age 18 and over, there were 86.6 males. The median income for a household in the city was $37,351, and the median income for a family was $43,125. Males had a median income of $28,699 versus $24,630 for females. The per capita income for the city was $17,950. About 7.2% of families and 9.1% of the population were below the poverty line, including 11.0% of those under age 18 and 10.5% of those age 65 or over. Public education for elementary and secondary school students is primarily provided by the Greenbrier School District, which leads to graduation from Greenbrier High School. On February 27, 2011, a magnitude 4.7 earthquake hit just outside Greenbrier. The quake was felt in several adjacent states, and as far away as Iowa. A swarm of almost 800 earthquakes have hit Arkansas since September 2010. Greenbrier is represented in the Arkansas House of Representatives by the Republican Stephen Meeks. ^ a b "Geographic Identifiers: 2010 Census Summary File 1 (G001): Greenbrier city, Arkansas". American Factfinder. U.S. Census Bureau. Retrieved April 14, 2016. This page was last edited on 22 August 2018, at 18:09 (UTC).